Posted in Beef, Essays, on January 15th, 2009. I was reading through a rather lengthy article in the January/February issue of Cooking Light, and was quite fascinated by some of the info. No matter how much I think I know, there’s always more to be learned about the different cuts, the methods of cooking, and how lean or fatty any cut is . . . The article was titled “How to buy the best beef,” and was written by Aliza Green, the author of a new book titled Field Guide to Meat. Photo at left is from the article itself. How about these factlets: (1) we Americans consume 63 pounds of beef a year (wow, no kidding? );(2) In 1976 we ate 89 pounds per person per year (yikes); (3) 90% of the beef we eat is grown right here in the U.S., with most of the balance coming from Canada; (4) cattle weigh about 1000 pounds at slaughter, and are 18-24 months old. The article also stressed budget-friendly, lean and flavorful cuts. 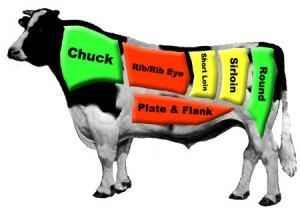 In addition to the usual that we probably know about already (tenderloin, flank and sirloin) it recommended the Bottom Round (best if marinated); Hanger Steak (rich and beefy, for searing, grilling or broiling); Tri-Tip (rich flavor, affordable, for roasting or grilling whole, then sliced); Shoulder Tender (like pork loin, to be sliced into medallions for grilling); and Shoulder Center Steak(moderately tender, to be served whole or sliced). Since I go for ribeyes, I generally don’t even look further, but perhaps I should.